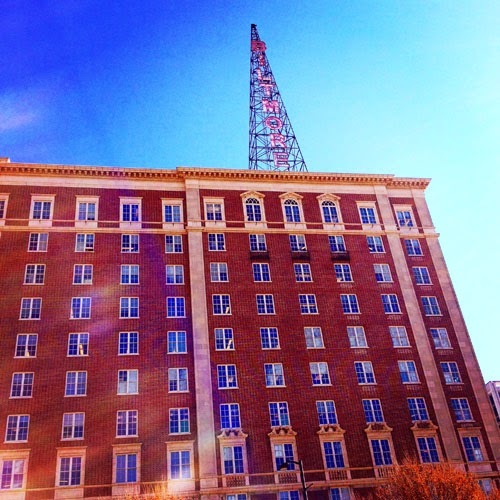 Coffee With Hallelujah: #REVERB14 (Day 1): Change is good--of this I am absolutely certain! #REVERB14 (Day 1): Change is good--of this I am absolutely certain! Hallelujah for opportunities to reverberate, to REVERB with Kat McNally, whose mission is to remind you that you are never alone! Situated in Melbourne, Victoria, Australia, Kat has been hosting this December blogathon since 2011, and she does a heart-warming and inspiring job! Join #REVERB14 here for 21 days of continuous blog writing, posting, and commenting to prepare you for 2015! 1. The change in my life is good! 2. Life spirals offer renewal! 3. Embodying English creates confidence! 4. InterPlay provides tools that make the English classroom a fun place to learn! CHANGE IS GOOD. 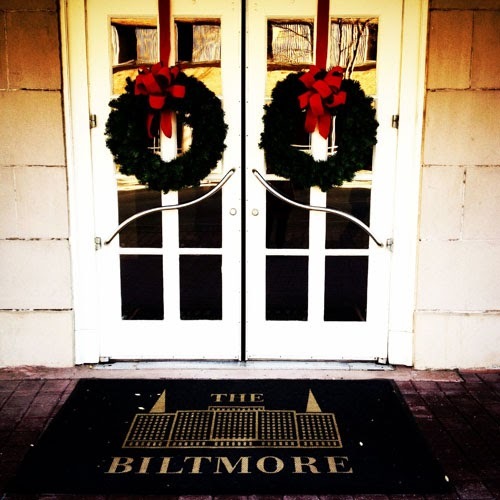 The Language Institute at Georgia Tech has blossomed beautifully into the Biltmore extending itself from its Sixth Street location into ample office space and new classrooms. This morning's teaching experience brought me to this expanded location for the first time, and OH! was my heart beating with joy! 1. I'm certain that the CHANGE IN MY LIFE IS GOOD! 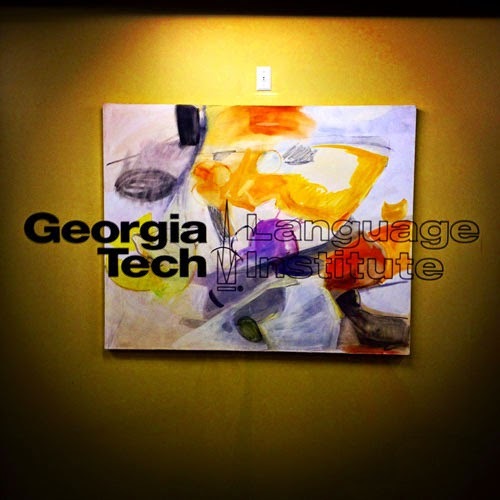 Many of you know that I left my regular teaching position at Georgia Tech's Language Institute more than a year ago because I was ready to try something different. Even to continue teaching, I was craving a new approach, a way of being in the classroom. With great courage, I left my 20-year position as an English Language Instructor to deepen my experience in art making, creativity coaching and community building, and leading InterPlay, an improvisational system that has many uses in education and creativity. EMBODYING ENGLISH INCREMENTALLY. 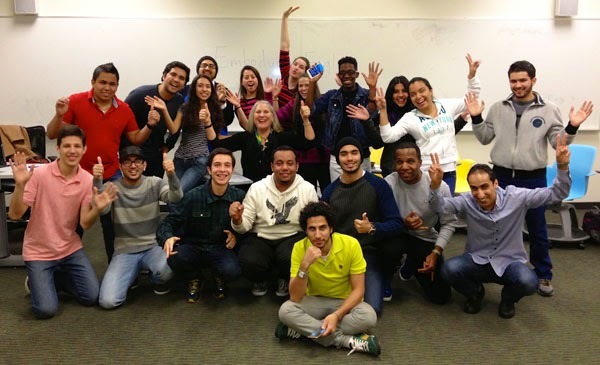 International students welcome the opportunity to play with English. Here, I am warming up students with a fun improv activity called 1,2,3. It provides an incremental step to having the students use all of themselves when communicating in these English speaking activities. Like an infant learning to walk, I have experienced my professional life outside the classroom as challenging with some awkwardness and spills. However, overall, the changes in daily routines have been immensely stimulating. I have met numerous people and begun new, meaningful friendships. Training to be an InterPlay leader has been life changing, to say the least. And I love being the administrator of the Facebook group, The Daily Creative Practice, which I started to create a warm online community to support the "uniquities" in everyone (join us here). Also, I have been fortunate to be invited back to the ESL classroom on various occasions to begin integrating the improvisational tools of InterPlay into my instruction--and that is FUN! 2. I'm certain that LIFE SPIRALS OFFER RENEWAL! Okay just what is a "life spiral"? Instead of seeing the repetition in your life as a "vicious cycle," why not claim all of your experiences and acquired wisdom and see yourself on a journey rising up on an ascending spiraling staircase of success? 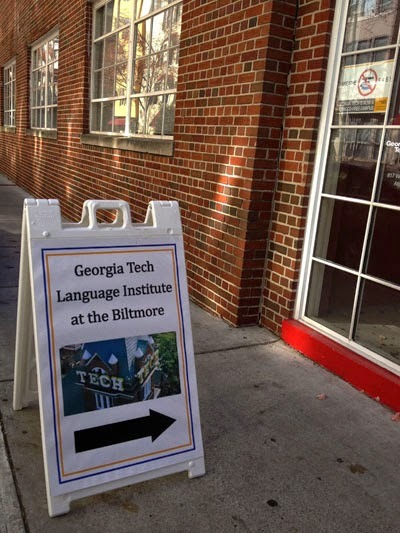 For me, today was thrilling, as I--a master teacher--re-entered the ESL classroom, at Georgia Tech's Language Institute ready to lead two classes of international students in InterPlay, a new methodology to me (but celebrating its 25th anniversary this year). Blending the old instructor with the new revived me, fueled me up, and made me question, "What's next?" 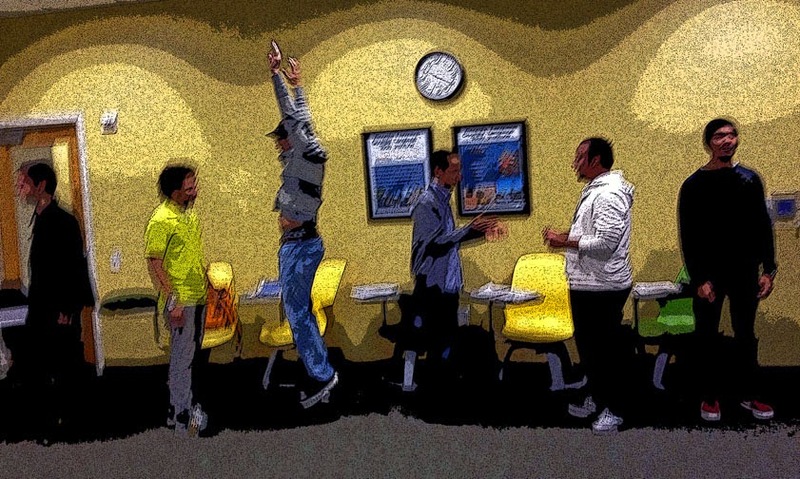 INTERPLAY IN THE INTERNATIONAL ESL CLASSROOM. We moved. We vocalized. We babbled. We told stories and played around with vocal variation. Most important of all? We had fun! This certainty I have about language instruction has been forming for several years now. 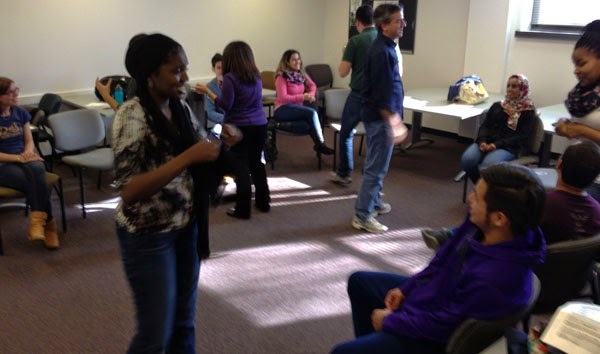 Along with the help from my friend, former creativity coach, and improv teacher, Lesly Fredman, I developed an ESL-Improvisation class in 2012 at the GT Language Institute (see this blog here for a taste). Seeing the transformation in the students from the beginning of the 8-week session to the end was surprising and fulfilling. Improv gets students away from their desks and creates opportunities for them to interact fully bodied, entering and exiting, standing then moving, and using their imaginations in subtle yet powerful ways. Once, a female student from the UAE remarked at the end of an improv class that she felt like herself for the first time since coming to the United States. 4. I am certain that INTERPLAY PROVIDES TOOLS that makes learning English FUN! As I continue my journey on this particular life spiral, I am certain that using the improvisational tools of InterPlay makes teaching and learning English as a second language fun. Today, 31 international students "played" with me in the language classroom! Coming from countries such as Saudi Arabia, Brazil, Senegal, Colombia, Venezuela, Germany, Libya, and the Ivory Coast, these students enthusiastically engaged in the lesson on "embodying English" that I brought to them. I am so thankful for their earnest commitment to learning English and trusting me to teach them using the methodology of InterPlay. We all had fun evidenced from the laughter, the volume levels and interactions! BIG BODY STORY. As students played around with speed, volume, and pitch, to tell their stories, they began to use their entire bodies, first standing and then moving off their spot to other places in the room! There is so much more that I am certain of but for now that's Coffee with Hallelujah! SOUL BLOG with me and tell me what you can say with certainty! Kat McNally! Thanks for dropping by my blog on the first day of #REVERB14! And for your warm words of support. You made my day! I can tell you with certainty that this post delights me. YES to change, YES to spiralling, YES to finding perfect-fit tools. And YES TO enthusiastic expansive beautiful expression. You've got it all. Deborah you got it! I love it when I successfully communicate! Appreciate your affirmations very much!